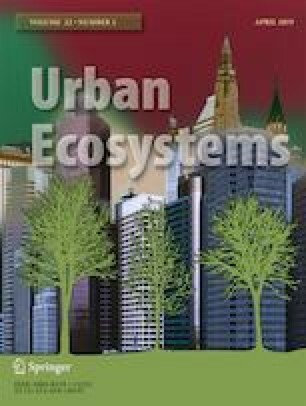 Urban parks are likely the last green areas to preserve fauna diversity in urban ecosystems. We predicted that 1) species richness and ant diversity would increase with increasing park size, and species richness and ant diversity would be inversely related to distance from a peri-urban forest. 2) Larger ants would be predictably prevalent in less-complex habitats but the reverse should be true for small ants. The study was conducted in 47 parks of varying size located in Taichung City, Taiwan. In total, 14,324 ant individuals from 50 morphospecies and 22 genera were collected. No relationship between ant diversity and distance from a peri-urban forest. No significant clustering in functional composition with increasing park size and distance from a peri-urban forest. However, urban ant diversity marginally increased with increasing park size. Larger parks, characterize by heterogeneous fine-scale habitats, had the highest ant species and abundance of ants. The prevalences of opportunist, generalised myrmicinae (GM), and cryptic ant species were linked to increased soil moisture, number of tree species, and leaf litter depth. The positive association between GM and the number of trash bins. Our finding disproved the size-grain hypothesis, but hotter ground surface favored the presence of long-legged ants. The significant association between head width, inter-eye distance, eye width, and environmental variables such as understory vegetation cover, leaf litter depth, and soil temperature suggest that predaceous ants might be prevalent in heterogeneous fine-scale local microhabitats. In conclusion, our study evidenced the importance of heterogeneous fine-scale habitats in urban park to biodiversity. Kuan-Ling Liu and Min-Xiao Peng contributed equally to this work. The online version of this article ( https://doi.org/10.1007/s11252-019-00851-z) contains supplementary material, which is available to authorized users. We thank Wan-Xuan Li (NCHU) for technical assistance and two anonymous referees whose comments greatly improved the manuscript. The project was supported by the Ministry of Science and Technology, Taiwan (MOST 106-2311-B-005-010-MY3).